Investors have relied on auto parts retailers for years as reliable sources of growth and dividends, but that is changing. According to the latest studies, by 2042, 93% of the US car fleet could be electric vehicles. As a rough estimate, electric vehicles have about 1/10th of the ongoing requirement for repair and replacement parts. Over the next decade, pure-play auto parts retailers will suffer declines in revenue and earnings. 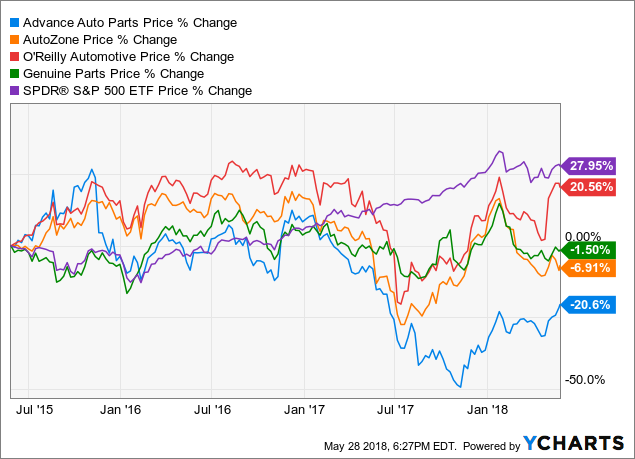 Conservative long-term value investors should consider avoiding the stocks of pure-play auto parts retailers, including AAP, AZO, and ORLY. Investors have relied on auto parts retailers for years as reliable sources of growth and dividends, but that will almost inevitably change over the next decade. 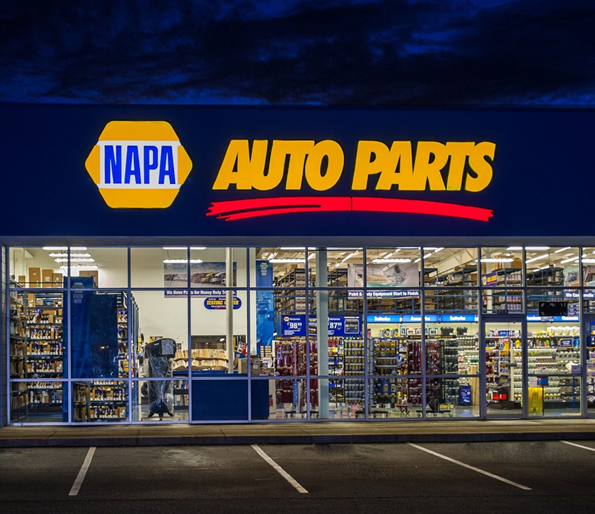 Genuine Parts Company (GPC), known to enthusiasts and industry participants alike through its NAPA brand, recently increased its dividend for the 62nd consecutive year. Trading with a 3% dividend yield and off its 52-week high, the company merited a look as one I’ve long wanted to own at a good entry point. As I performed more research, I was reminded of the insidious nature of disruptive technological change. Horse-drawn carriages were replaced by automobiles, typewriters by word processors, landlines by cell phones, newspapers and broadcast TV by the internet. With each change, there were winners and losers. Pure-play auto parts retailers like Advance Auto Parts (AAP), AutoZone (AZO), and O'Reilly Auto Parts (ORLY) will eventually face the permanent loss of a significant amount of revenue. Even best-of-breed GPC, a somewhat different animal, will not be immune. I do not believe the demise of the industry is imminent. However, the more I learned the more I became convinced that, perhaps not over the next 3-5 years, but definitely over the next 10, it will not be business as usual. The stock prices of all the companies mentioned above have lagged the S&P 500 (represented by the SPDR S&P 500 ETF) over the past three years as technological change, combined with what appears to be industry over-expansion, has begun to drag on profitability. In terms of technology alone, internet retail was a major blow, and cost-effective 3-D parts printing is on the verge of having an impact, but the rise of electric vehicles (“EVs”) will be the most important factor over the next decade in making the auto parts industry a minefield for investors. SEATTLE, Oct 26, 2006 /PRNewswire-FirstCall via COMTEX News Network/ - Amazon.com (Nasdaq: AMZN) today announced the grand opening of its Automotive Parts and Accessories Store (Amazon.com: Automotive) featuring over 1 million new, used and remanufactured parts from leading parts and accessories manufacturers. The online world gradually became easier to deal with while the once reliable employees at these stores were replaced with 18 hour-a-week part-timers who received minimal training and zero benefits. The auto parts stores often competed against their own online operations. With some 16,000 US stores among the auto parts retailers, the future looks like one of consolidation, mergers, and store closings. These machines are not suited for mass production, but they work well for rapid prototyping. Just as eBay has made many swap meets go away, this machine could eliminate the need to go to eBay for parts. The average user is now gaining access to 3D printing and the materials needed to create precisely-made, durable parts. Currently there are many options for printers under $500 that can create small parts from durable ABS plastics, which can be used right off the printer. If a metal part is required, the printed piece can act as a mold in an investment casting process to create an exact replica in the material desired. If you need more sophisticated rapid 3-D prototyping, Proto Labs (PRLB) can 3-D print parts starting at a cost of $95. The internet wreaked havoc on auto parts retailers, and they fought back. The promise of 3-D printing is here now for car enthusiasts restoring classic cars and in the future for the rest of us, but the widespread adoption of EVs will be the evolutionary change that may end business as usual for auto parts retailers. As the chart below indicates, according to the Bloomberg report, 55% of all light vehicles sold by 2040 are expected to be either battery electric (“BEV”) or plug-in hybrid (“PHEV”) vehicles. 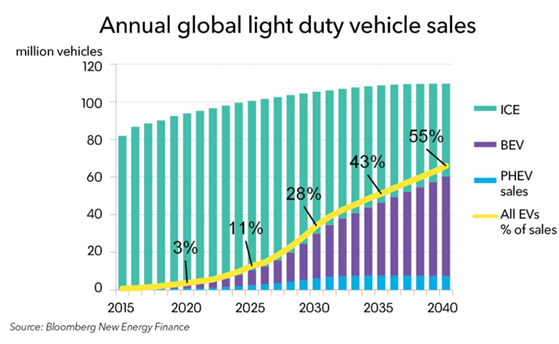 By that time, about 33% of the global light-duty vehicle fleet will be electric - with EVs comprising much higher percentages of the total vehicle fleet in developed nations. Note that some of the above models are not available in the US, only available in selected parts of the US or in limited quantities. Manufacturers have also announced ambitious future plans. Toyota (NYSE:TM) set a goal to sell more than 1 million electric vehicles by 2030. Volvo (OTCPK:VOLAF) aims to do the same by 2025. Volkswagen (OTCPK:VLKAF) has allocated $40 billion to the development of electric vehicles with an initial goal of 25% of its vehicle sales to be electric by 2025. BMW’s (OTCPK:BMWYY) goal for 2025 is for 15% to 25% of sales to be electric. Mercedes-Benz has allocated $11 billion for the production of electric vehicles under its EQ brand and will sell 10 distinct long-range EQ vehicles by the end of 2022 with a goal of 15% to 25% percent of global sales by 2025. Studies by the IMF suggest that the crossover to a majority of EVs could happen faster than we might expect. Patterns observed in the early days of the horse-car transition closely resemble present-day electric vehicle adoption rates. Between 2011 and 2015, the average annual growth rate of electric vehicle ownership was 120 percent. This is, in fact, slightly faster growth than that of motor vehicles during a comparable timeframe in the past. 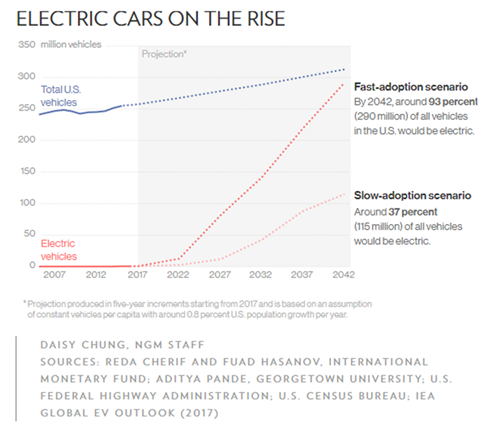 Using the horse-car parallel, the paper forecasts that by 2040 motor vehicles [i.e., vehicles powered by IC engines] could mostly disappear in advanced economies and could comprise about a third of the fleet of all cars in emerging market and developing economies. 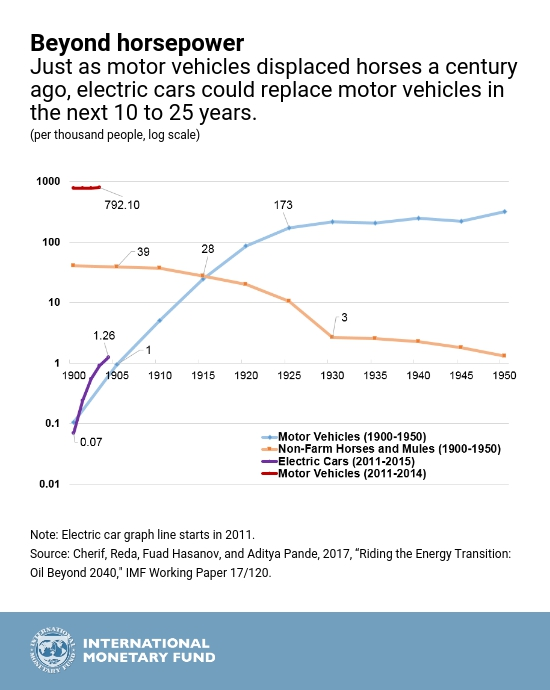 One of the more interesting findings of the IMF study is that the growth rate of electric vehicle ownership has been faster than the growth of ICE-powered vehicle ownership in the days of the Model T. The chart below shows how, in about 15 years, automobiles overtook horses as the preferred means of transport - and that EVs are on a faster trajectory. You can get a sense of the disparity from a recent report by some enterprising UBS financial analysts, who tore apart one of GM’s $37,000 Chevrolet Bolt electric cars to see what it cost to make. 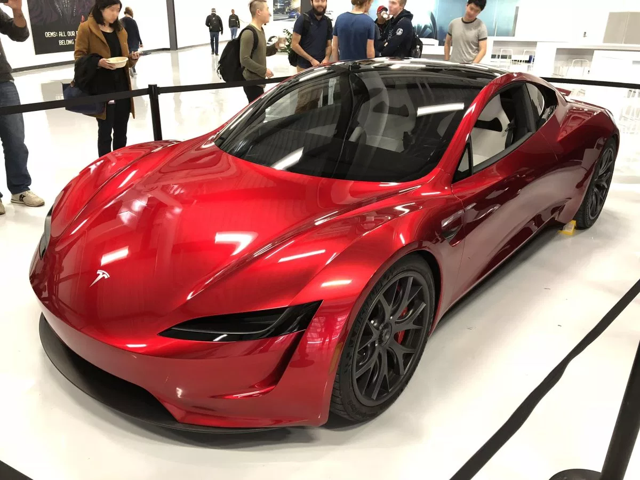 They found it was $4,600 cheaper to produce than expected and concluded that, with further cost falls likely, electric cars would probably disrupt the industry faster than widely understood. Quick on its feet and fun to drive, the Bolt EV gives Tesla a run for its money. A floor-mounted battery powers a 200-hp electric motor; in our testing, we recorded 96 MPGe and a 75-mph highway range of 190 miles. It rides well over rough roads and acceleration is great, launching the car to 60 mph in 6.5 seconds. The cabin has a 10.2-inch touchscreen and a driver-facing 8.0-inch digital gauge cluster. Apple CarPlay, Android Auto, and 4G LTE Wi-Fi are available. Charging times are on the verge of dropping radically. By 2022, Honda (NYSE:HMC) plans to equip its EVs with batteries that can be charged in 15 minutes for a 240 km range (149.1 miles). Toyota is working on fast-charging solid-state batteries to replace current state-of-the-art lithium-ion batteries. Swiss company ABB (NYSE:ABB) has announced its Terra High Power DC fast charger, which can put out an impressive 350 kilowatts, charging at nearly three times the rate of Tesla's Superchargers - but no EVs on the market can currently accept its output. Chargepoint, a private company creating a network of charging stations, has announced 400 kilowatt chargers that could deliver power for 200 miles of electric range in as little as 10 minutes. Range has been one of the key fear factors convincing people not to buy an EV. That is about to change. There are two elements of range, charging stations and battery capacity. Charging stations are on their way to being as ubiquitous as gas stations. 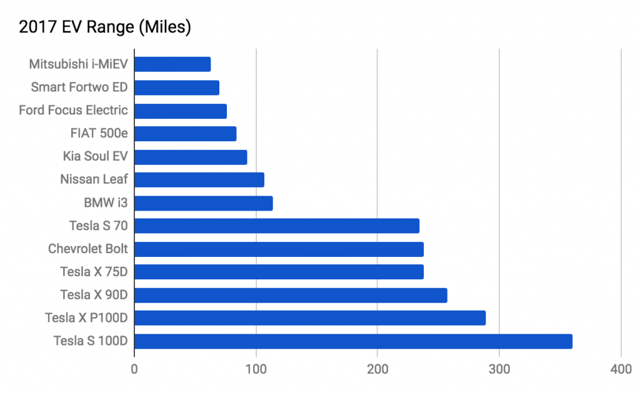 Tesla’s Supercharger network now includes about 5,000 units at nearly 800 fast-charging stations capable of charging its vehicles for about 170 miles in 30 minutes. Other automakers are committed to building their own proprietary charging networks, VW, for example, plans 2,800 charging stations in the US by the end of 2019. As of November 2017, per Statista, there were 16,541 charging stations in the US - and that number is growing very rapidly. Battery capacity is increasing as well. The chart below shows the range of some EVs available in the US. Tesla claims a zero-to-60-mph time of 1.9 seconds and a top speed of more than 250 mph; all-wheel drive will be standard and a 200-kWh battery is said to provide 620 miles of range. The car is not a ghost. It has been caught on video at the Fremont test track. It is becoming harder and harder to not accept that we will be driving electric vehicles in the relatively near future. If we accept that EVs will eclipse gas and diesel-powered vehicles, what will this mean for auto parts retailers? EVs require less maintenance than vehicles powered by IC engines. The battery, motor, and other electronics of EVs typically require little to no maintenance. There are fewer fluids that need to be replaced, and brake wear is reduced with regenerative braking systems. Since there are fewer moving parts, there are fewer parts exposed to the daily wear and tear that causes parts to fail over time. 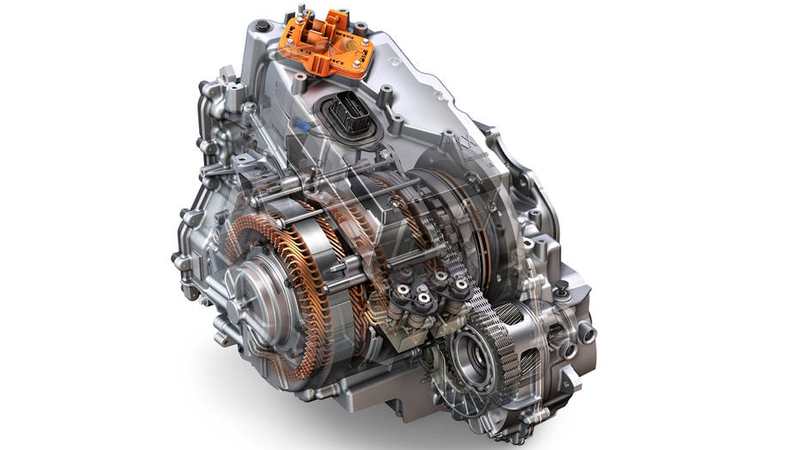 Below is a picture of the Chevy Bolt Voltec drive unit. Exactly how many fewer moving parts EVs have compared to gas and diesel-powered vehicles is open to some conjecture. Information directly from Tesla indicates 17 moving parts in its drivetrain alone compared to 200 for an IC-powered vehicle. J.P. Morgan Cazenove, the European arm of the US bank, claims 20 moving parts in an EV compared to 2,000 in an IC-powered vehicle. Fewer moving parts in the electric vehicle leads to another important difference. The electric vehicle requires less periodic maintenance and is more reliable. The gasoline-powered vehicle requires a wide range of maintenance, from frequent oil changes, filter replacements, periodic tune ups, and exhaust system repairs, to the less frequent component replacement, such as the water pump, fuel pump, alternator, etc. EVs will still require windshield wiper blades, tires and other parts, but they won’t require belts, hoses, spark plugs, oxygen sensors, oil, fuel and air filters, valve cover gaskets, ignition coils, transmission parts, or a host of other parts related to IC engines that provide the bread-and-butter of auto parts retailers. Not only do EVs use fewer parts, but increasingly data suggests that they are more reliable than IC-engine vehicles. According to Consumer Reports, the Bolt is the most reliable car GM makes. All of this is very bad news for auto parts retailers. In the future, there will be on the order of 1/10 as many parts required to maintain, repair or modify vehicles. How Fast Will the Existing ICE Fleet Age Out? The main counter-argument is that IC vehicles will be with us for much longer than we think. Indeed, the average age of light vehicles on the road - mostly gas and diesel-powered - recently hit an all-time high of 11.6 years and most analysts claim that, by 2040, only 33% of the world’s fleet of light vehicles will be EVs. That would still leave 67% of all vehicles requiring parts associated with ICE-powered vehicles. Another way to think of that, however, is that somewhat less than 33% of auto parts retailers’ business will have evaporated with an associated decline in revenues and earnings. Higher parts prices might help, but there’s internet competition driving prices down. Consolidation among the auto parts retailers will probably be part of the end game for the industry. We were surprised at how fast cars replaced horses as the main means of transport in the early 1900s," says IMF economist Fuad Hasanov. “It happened in only 10 to 15 years in spite of the many hurdles. In the 1980s, when cell phones were bulky, expensive, and had a short battery life, experts predicted that by 2000 the industry might sell 900,000 units a year. Actual sales that year were 109 million—and by 2014 another unexpected technology transition had happened: Virtually all of those phones were smart phones. J.P. Morgan Cazenove also believes EV dominance will occur much faster than most realize. 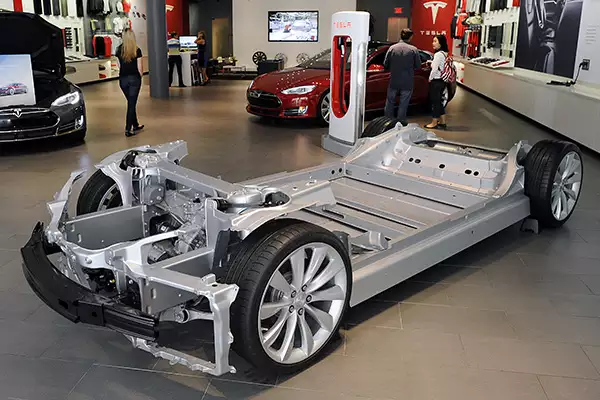 As battery costs fall, the price differential between EVs and ICE-powered vehicles will reach a tipping point where owners become concerned about the scrap values of their ICE-powered vehicles. The J.P. Morgan analysts predict electric cars could account for 35% of the global auto market by 2025 and 48% by 2030. There is a very good chance that when we look back on the pace of EV adoption, investors will find the humorous analogy very relevant. Investors considering an investment in an auto parts retailer like AAP, AZO, ORLY, or even the better-prepared and diversified GPC, should heed Bill Gates's quote that opened this article. At some point within the next decade, the differing characteristics of EVs will begin to eat into the sales of auto parts retailers. 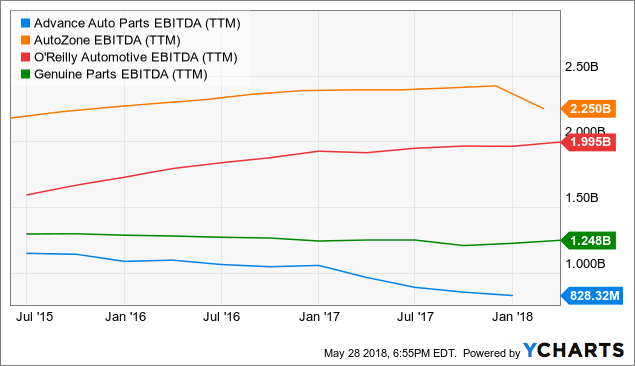 Internet retail, combined with industry over-expansion, is already having a negative impact that can be discerned from a virtual flat-lining of EBITDA over the last three years. As a long-term oriented, conservative value investor, I plan to avoid investments in pure-play auto parts retailers and leave these stocks to others who know the companies and industry dynamics better and can time their exits over shorter investment horizons. In today’s environment, retail investments are difficult enough without having to forecast the timing of disruptive technological change brought about by the switch to EVs. Although GPC’s amazing history of success remains intriguing and deserves further study, about 57% of projected 2018 total revenue of $18.0 billion is expected to be from its Auto Parts Group.